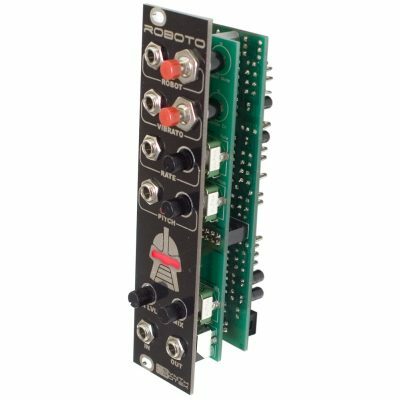 Need a vocoder, pitch shifter, speak-n-spell effect, vibrato, 8-bit modulator and a bit crusher sounding module all in a lo-fi heavily CV controllable package? Well surprise! we read your mind! The Roboto module is all these and more (and it has a Cylon looking graphic that lights up). Check it out! Can be in either Robot mode or Pitch mode, but not both. Handy LEDs tell you which mode you’re in. The ROBOT button toggles between the two. 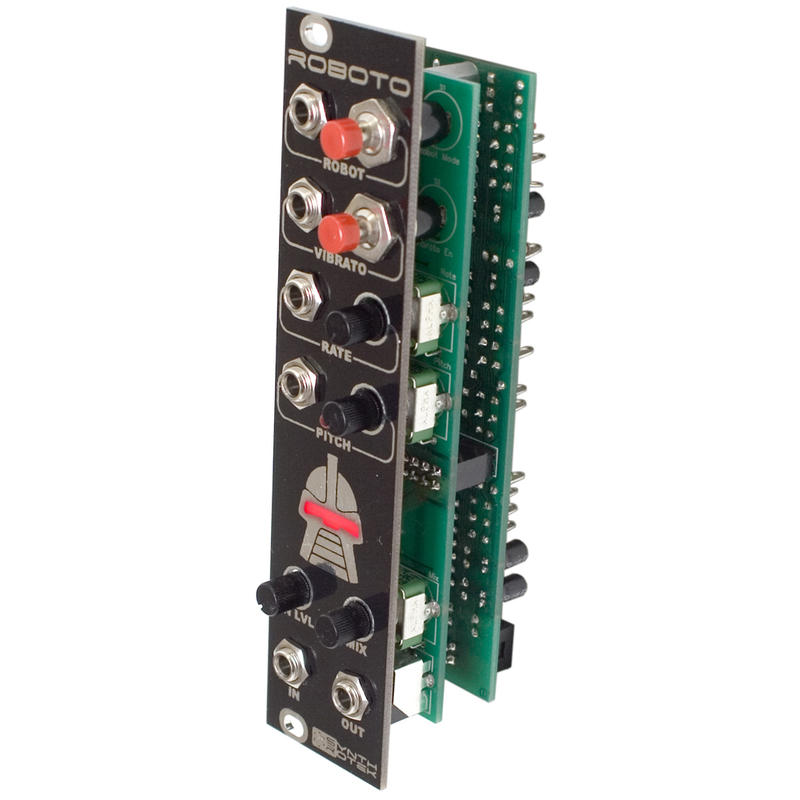 Robot and Vibrato CV inputs activate those modes (and deactivates in the case of vibrato) upon receiving a gate pulse. Gate pulses in these inputs are just like pushing their corresponding buttons. Expected transition is from 0V to +5V (and back to 0V), but it will handle any voltage within the power supply range without damaging the module. Transition between what is considered “off” and “on” is at approximately 2.3V. 0-5V fed into the Pitch jack mimic the full travel of the pot (0V is lowest, 5V is highest, normal is ~2.5V). Voltages outside this range are tolerated but won’t provide any added functionality.